After watching Chef Mark Peel win a cooking challenge, I was eager to try his restaurant Tar Pit on La Brea Ave. From the outside it lacks curb appeal. 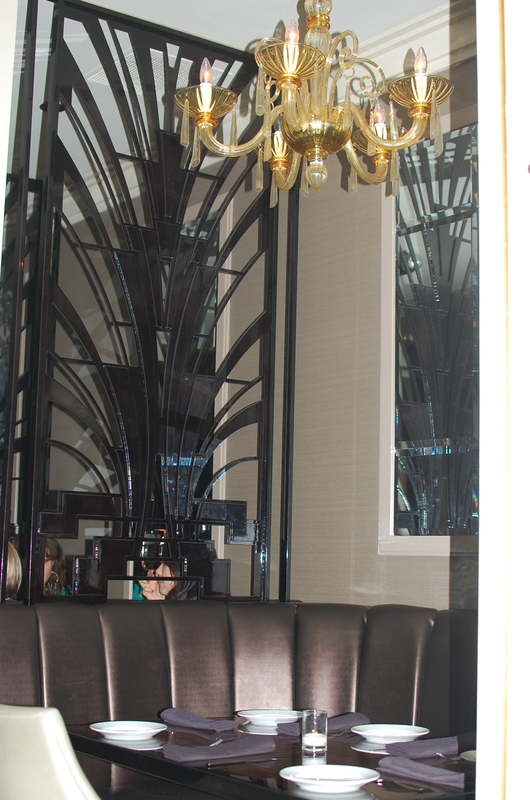 Inside it has a 1940s Hollywood glamour supper club feel with its Art Deco ironwork separating the beige banquettes. As a native Californian, Peel worked in a series of kitchen jobs in high school and enrolled into the hotel and restaurant program at Cal Polytechnic University in Pomona. While in college, he landed a job with Wolfgang Puck peeling vegetables at Ma Maison. Later, he became the sous chef at Michael McCarty’s restaurant, Michael’s in Santa Monica. While working with McCarty, Peel met and later married the pastry chef, Nancy Silverton. With an opportunity to work with Puck again, he became the original head chef at Spago in 1982. Years later, Peel and Silverton opened La Brea Bakery and Campanile restaurant on La Brea Ave. just a few blocks south of Tar Pit. Not in a drinking mood, we forgo the amusing cocktail list. The cocktails are arranged on the menu by categories: More tart than sweet, Crushed, A little Adventure and Spirited & Direct. Like other high end bars in Los Angeles, the bartender squeezes fresh fruit juice into the glass, has a variety of housemade simple syrups, good bitters and charges $12. There are no draft beers on tap, however Peel has a limited selection of great beers in bottles for $6. Glancing at the whimsically designed one page food menu, I noticed a lot of fun dishes and light meals. Pickled deviled eggs with bacon, fried oysters with crisp ginger and preserved lemon remoulade, and macaroni and cheese with Gruyere, cheddar, mozzarella and Parmesan. We ordered the crab salad with large lumps of blue crab, sliced fingerling potatoes, diced roasted red peppers, celery, chervil, chives and tossed lightly with a subtle saffron dressing. It was scrumptious. 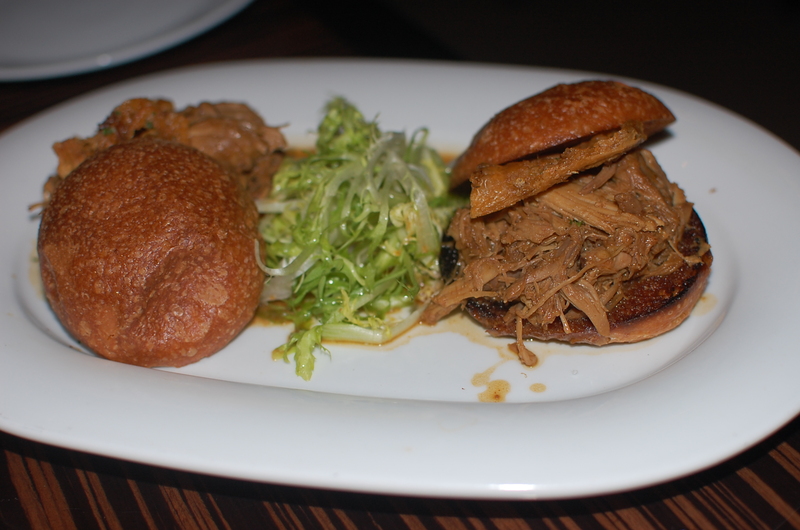 Next, arrived juicy duck confit sliders with crisp little cracklings rendered from the duck meat after roasting and topped with an orange gastrique to add a citrus flavor to the meat. They were presented with a small frisee salad on the side. Still a tad hungry we noticed almost every table had a heaping plate of Tar Pit fries, so we ordered one to see what the buzz was about. Crisp on the outside and tender inside, the potatoes are sprinkled with a spicy lemon salt, although I couldn’t taste the lemon, especially after dipping the fries into the heavenly housemade garlic aioli. 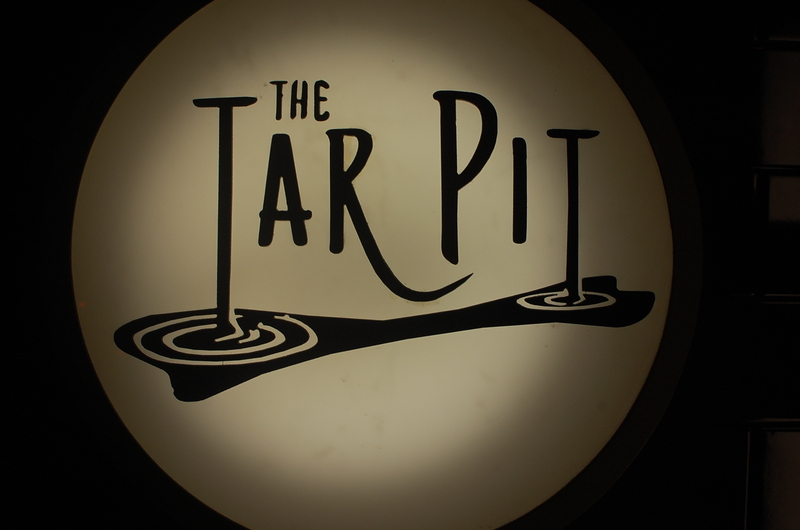 Why did Peel name his restaurant Tar Pit? Our server explained that he was inspired to name the restaurant after watching the movie “My Man Godfrey,” with William Powell as Godfrey. Godfrey, a down and out man in the beginning, opens a fabulous bar at the end of the movie called, The Dump. Its location is at the exact spot where he was discovered in the beginning of the movie. Peel seems to have good luck with his restaurants on La Brea Ave. He spends half his time at his successful Campanile and the other half at Tar Pit. He is very hands on. While we were at Tar Pit, the ice machine broke down. Peel arrived quickly to keep the restaurant running smoothly while the machine was being repaired. We finished our meal with two desserts. Fortunately, they weren’t huge. 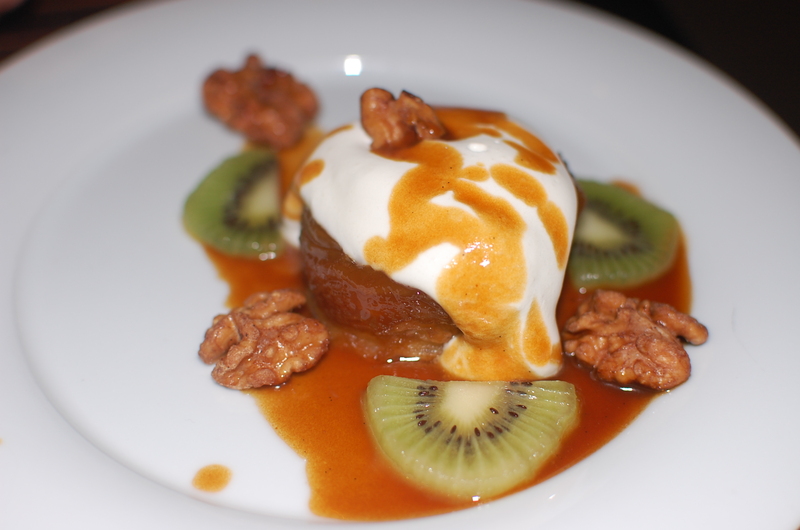 The apple tart tatin arrived with sliced apples, kiwi fruit, spiced walnuts, puff pastry with a generous dollop of whipped crème fraiche and embellished with caramel. My favorite was the chocolate caramel tart with little scoops of bitters and orange ice cream bathed in chocolate sauce. As we paid our bill, we were invited to come back on Sunday evening to hear the live rock/blues band, Vintage Trouble. Their influence is Ray Charles, Prince, Ike & Tina and The Rolling Stones. The band starts playing at 9 p.m. Check the Tar Pit website to see the band’s monthly schedule. On Mondays, Peel has a burlesque show that begins at 9:30 p.m.